November 30, 1964: From Stamford to the mountaintop. On November 30, 1964, “the most notorious liar in the country” came to speak at Stamford High School, and my aunt was among 2,000 to 2,500 people who came out to hear him. From the sound of it, she found him pretty believable, and still does. November 30, 1964. The Yankees take outfielder Leon “Duke” Carmel from the Mets in the Rule 5 draft, the first direct transaction between the two teams. Instead, I’ll set the scene by noting where King was on Nov. 30, 1964. In December 1964, King also began to join civil rights protestors in Selma, Alabama, culminating in the famous marches of March 1965. Still in the future were King’s involvement in housing-related protests in Chicago; his outspoken opposition to the Vietnam War; and his support for striking black public works employees in Memphis, which immediately preceded his assassination in April 1968. As of late November 1964, King was also the author of four books, with his most recent, Why We Can’t Wait, being published in July of that year. And — in an honor that was most certainly noticed at 1107 Hope St. — King had begun 1964 by being named Time magazine’s Man of the Year. Two excellent retrospective stories by the Stamford Advocate fill in some of the specific historical blanks from Nov. 30, 1964. King’s Stamford appearance was arranged by religious groups as a fundraiser for his Southern Christian Leadership Conference. When the high school auditorium filled with people, an overflow area was set up in the gym. A bomb threat was called in before the speech, and protesters standing in frigid temperatures outside the school branded King a Communist. But neither one stopped the event. King’s speech was filmed by John Maher, a high school student from nearby Darien. Unfortunately, while copies of the film were circulated in Darien schools and also offered to King, no copy is known to survive. The Advocate’s retrospective story does not capture King’s speech extensively either — simply indicating that he spoke on topics of civil rights, inequality and segregation. Yes, I remember seeing Martin Luther King Jr.! It is one of those memories that is seared into one’s mind. I went with our MYF (Methodist Youth Fellowship). I think I had seen a poster that MLK was going to speak at Stamford High School. Because I was interested in Civil Rights, as was our Minister, the info was passed on to the MYF. A small group of us decided to attend. What a life changing event! I have heard others say that MLK spoke in poetry, and he really did! I quickly started scrawling down some of his poetic speech on the program I had of the event there. Somewhere in my closet, I still have the program. Anyway, he spoke in a booming voice and looked 10 feet tall, so when he walked out in the aisle by me, I was surprised to see that he was actually shorter than I had thought. Anyway, back to the stage upon which he stood to speak: he was surrounded by a close circle of black men in hats with arms folded. I wondered why this was, and later realized they were there to protect him. I believe one of those young thin men was Jesse Jackson. Most of the audience was black, so our small mostly white MYF group was a minority–something that was new to me at the time, and the black people only looked at us curiously for a short minute. I believe this experience helped to shape my career. I attended Southern Connecticut State College because they had a program in education for urban youth, and I student taught in the New Haven inner-city schools. I was student teaching at one of those schools when MLK was assassinated. Everyone was devastated. We all were instructed to go home that day, because the situation could become dangerous. After that time, the tone of the inner city neighborhoods changed from hopeful to angry. However, I did go on to get my MSSS (Masters Degree in the Science of Social Service) from Boston University. At the time I made the decision to attend the MLK event, I had no idea that he would become so famous, or have such influence on myself and the world! June 5, 1968: What next? It’s always interesting, from a historical standpoint, to see which current events made it onto my grandfather’s calendars in the 1960s and ’70s — and which ones didn’t. Woodstock and the Kent State shootings didn’t get a mention. No great surprise, probably. I am sure my grandpa took heed of these events, but they would not have touched him as deeply as they did younger generations. Getting back to the calendars, the assassination of Dr. Martin Luther King, Jr., didn’t receive a mention either. I’m not sure what to conclude from that, or why my grandfather wouldn’t have considered that worth writing down. I’ve written before, quoting my father’s words, that my grandpa was not a fan of civil disobedience such as Vietnam War protests. I would like to think he recognized the righteousness of Dr. King’s cause, but perhaps he disapproved of his methods. I don’t know. 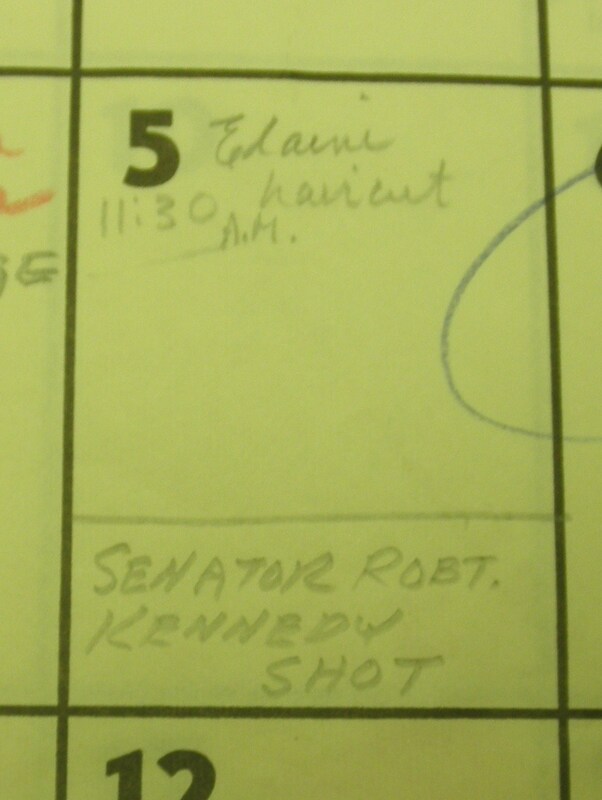 So, my grandfather would not have made this calendar entry because felt a close political kinship to Robert F. Kennedy, a Democrat like his brother. Perhaps he found it worth mentioning on his calendar because he was touched by the tragedy of two assassinations in one American political family within five years of each other. Or maybe he saw it as the climax of a violent time — a sort of “what next?” after the collective bloodshed of the John F. Kennedy and MLK assassinations, race riots in major cities, and other forms of civil unrest. Had I been my grandpa’s age in 1968, I suspect I might have seen the RFK assassination that way — as yet another tear in the civil fabric, and another frustrating step on a gradual but apparently unswerving path to lawlessness. My own generation has had only sporadic glimpses of political violence. I was appalled by the attempt on U.S. Rep. Gabrielle Giffords’ life in January 2011; and I can remember hearing about the assassination attempt on President Ronald Reagan almost thirty years before while riding a school bus home. Our veneer of political civility may be thinner than we care to admit. But hopefully it will hold through the upcoming Presidential campaign, and for many years beyond. I hope no American of our years will mark an otherwise ordinary day as the day a lifetime of leadership, dreams and possibilities died.